I was eating some chips the other day, when my palate was slapped with a piece of nostalgia. I'm not talking about the burnt beyond recognition chips. No, these are the chips that have been in the fryer just a tad longer than normal. While going through my Unwrapped addiction, I learned that they now employ high speed cameras and artificial intelligence to terminate these morsels of scrumptiousness. Compared to these gems, regular chips are bland conveyers of oil and salt. 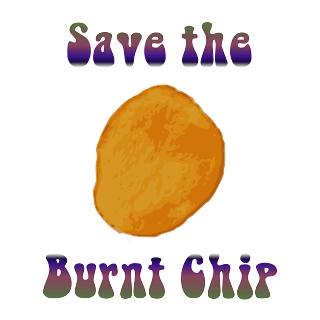 Anyway, join in the fight to save the burnt chips. Buy a tshirt or mug to help save these rare beauties.